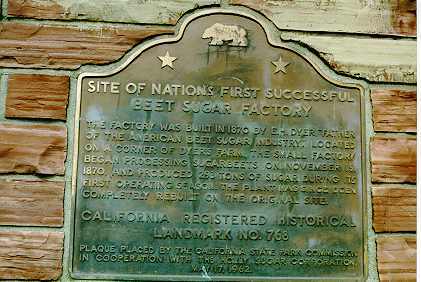 The factory was built in 1870 by E.H. Dyer, "father of the American beet sugar industry." Located on a corner of Dyer's farm, the small factory began processing sugarbeets on November 15, 1870, and produced 293 tons of sugar during its first operating season. The plant has since been completely rebuilt on the original site. 30849 Dyer St, Union City.